Seemingly a sailor who is amnesiac about all details of his personal life. For some reason he has 4 testicles. The real identity of this character is unknown. 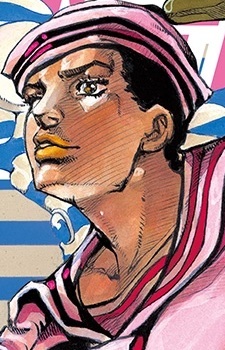 The second chapter stated that the Jojolion protagonist's name could be Yoshikage Kira, however it is later revealed that he is merely a doppelganger for the real Kira. He was later given the name Jousuke by the Higashikata family, who took him in. Josuke's original identity was that of Josefumi Kuujou, and became his current self after fusing with the man Yoshikage Kira. However, DNA testing implies that Jousuke and Kuujou are nearly the same person. Releases a bubble from Jousuke's birthmark. When the bubble pops near something, it "steals" something from that thing. For example, stealing the water from somebody will make the target thirsty. Jousuke can't use this ability on himself.